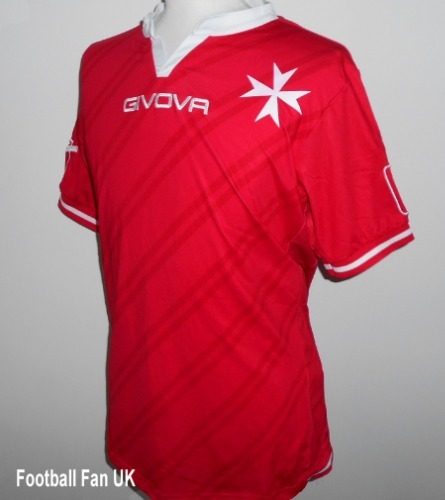 This is the new official short sleeved red home soccer jersey of the Malta national soccer team for the 2016-2018 seasons and used by the team in their World Cup and Nations League qualifying matches. It is an official shirt, made by Givova (Italy), and is new with tags in Givova packaging. - Heat transferred Maltese cross. - Woven Givova logos on chest and sleeves. - Red with subtle diagonal red stripes and white trim. - Malta FA logo at the back of the neck. - Made from 100% stretch polyester. - Size Adult Medium. Chest 41", length 28".